Freshen up doggy breath by rewarding your pup with mint-flavored Dr. Lyon’s Medium Dental Dog Treats. These chewy treats have a unique brush shape and texture that’s designed to fight plaque and tartar buildup as your dog chews. With a flavor dogs love and no grains, corn, wheat or soy, they’re easy to digest and perfect for everyday treating. They’re made to help keep your dog’s teeth in tip-top shape, and are just the right size. As your dog chews, these dental treats clean all the hard-to-reach teeth—ideal for in between brushings. Each treat is manufactured in the USA with domestic and imported all-natural ingredients that you can feel good about. 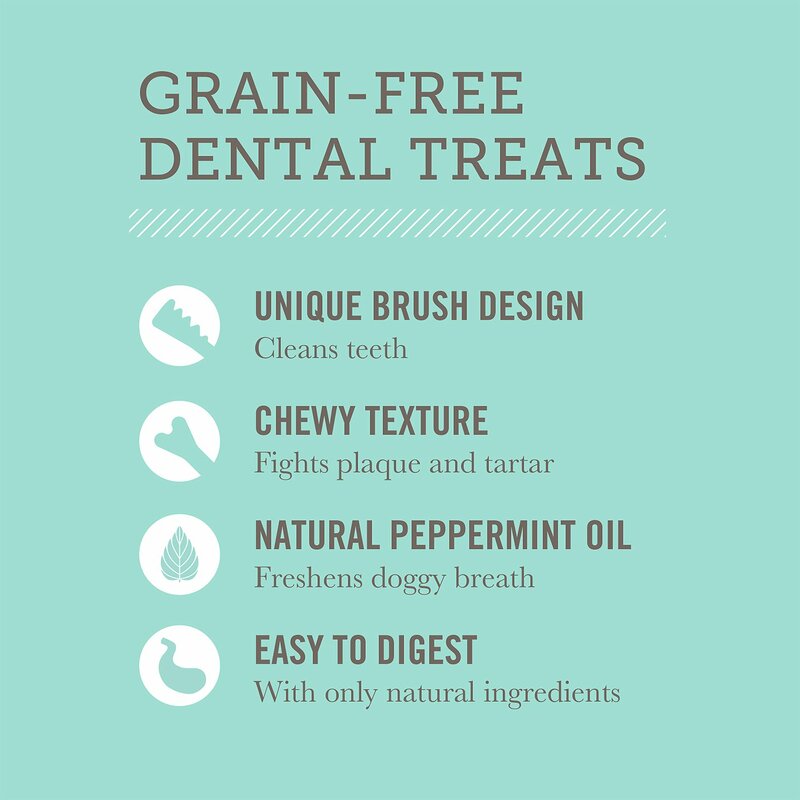 Grain-free dental treats help freshen up doggy breath with a refreshing mint flavor, and pups will love chewing them. Unique texture and brush shape that’s designed to clean teeth by targeting plaque and tartar buildup. Easy to digest with no grains, corn, wheat or soy, making them ideal for everyday treating. Manufactured in the USA with domestic and imported all-natural ingredients that you can feel good about giving to your dog. Made with a fresh mint flavor in just the right size treat for medium breeds to enjoy. Potato Flour, Pea Protein, Vegetable Glycerin, Pea Starch, Gelatin, Water, Natural Flavor, Sunflower Lecithin, Ground Flaxseed, Sunflower Seed Oil, Citric Acid, Zinc Propionate, Peppermint Oil, Mixed Tocopherols. 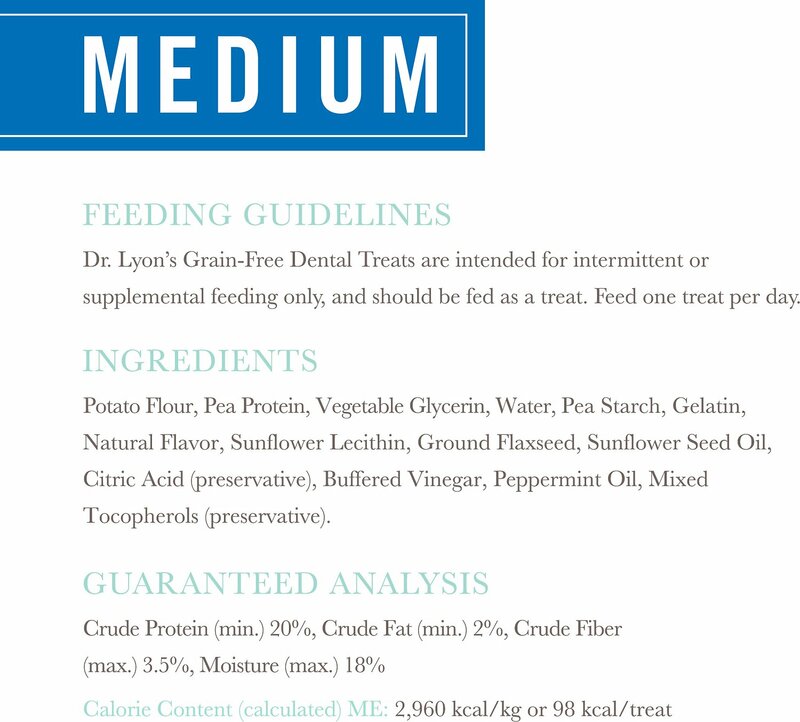 Dr. Lyons Dental Treats are intended for intermittent or supplemental feeding only, and should be fed as a treat. Pets should be supervised when chewing treats. Feed 1 treat per day. How do Dr. Lyon’s Dental Treats clean my dog’s teeth? 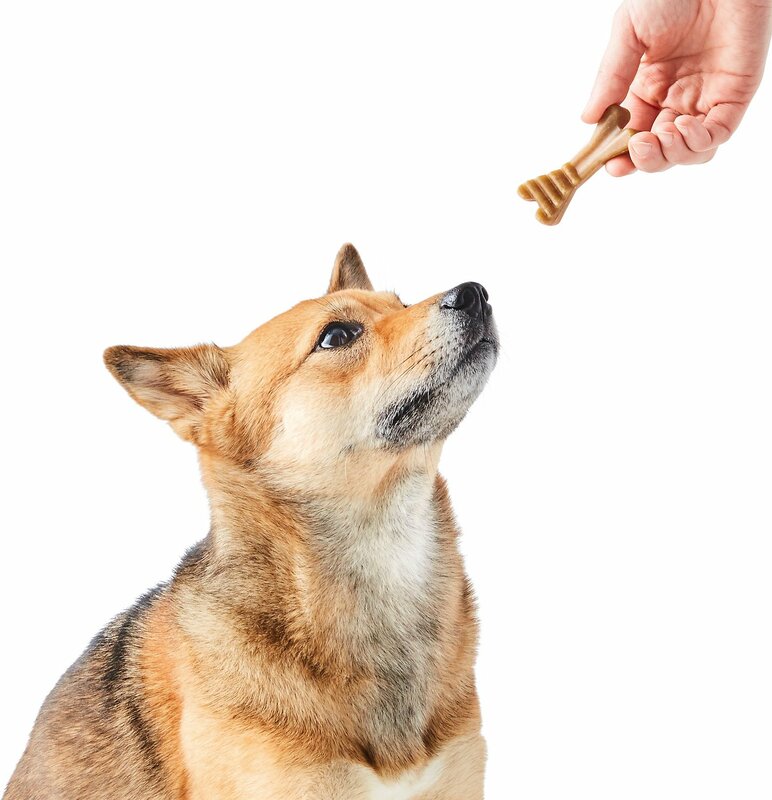 These treats have a unique brush shape and texture that’s designed to clean your dog’s teeth. As your dog chews, the textured surface features ridges and grooves to help clean all the hard-to-reach teeth—ideal for in between brushings. Yes, they are free from grains, corn, wheat or soy making them easy to digest and ideal for everyday treating. What is the texture of these like? The texture is firm but chewy – they are soft enough to bend and break in half. Depending on the size of dog and dog’s motivation of chewing, the treat will either break into hard chunks or get softer with chewing. These Dental Treats are flavored with a natural peppermint oil to help freshen breath. What’s the best way to store the treats after I’ve opened the bag? The treats come in a resealable pouch to maintain freshness. We recommend storing the pouch with the seal closed. Are these suitable for puppies? These treats are suitable for dogs of all life stages. What is the length of each Dental Treat? How many calories are in each Dental Treat? Extra-small has 24 kcal/treat, small has 50 kcal/treat, medium has 98 kcal/treat and large has 154 kcal/treat. Dr. Lyon's Dental Treats for Dogs offer an easy, delicious solution for doggy breath in a minty dental treat. They're flavorful and fun to chew, with a unique brush shape that's designed to clean teeth and tackle plaque and tartar buildup. 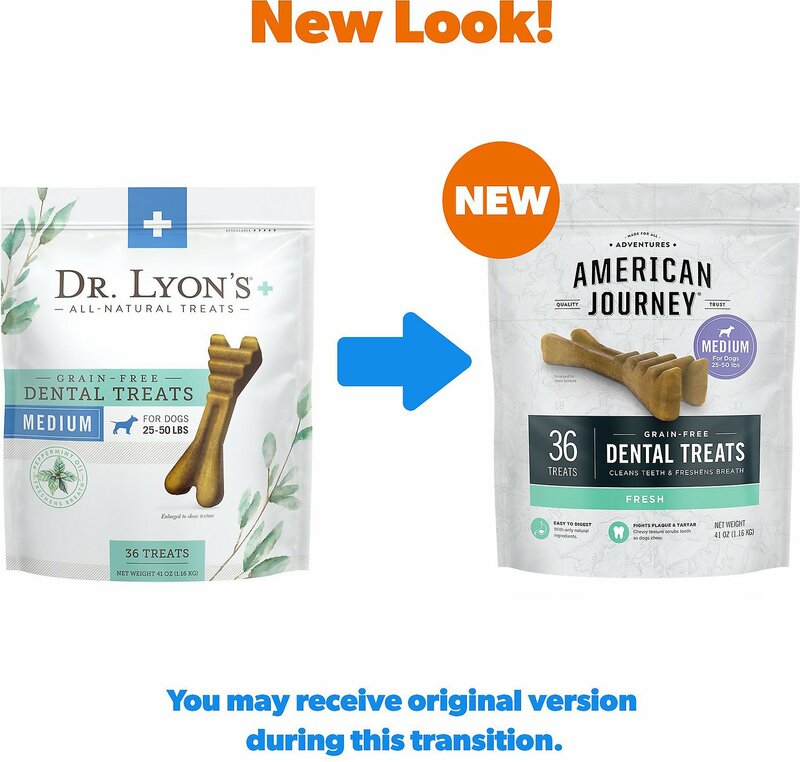 Dr. Lyon's manufactures these treats in the USA with domestic and imported ingredients using carefully chosen, natural ingredients to support your dog's dental health. 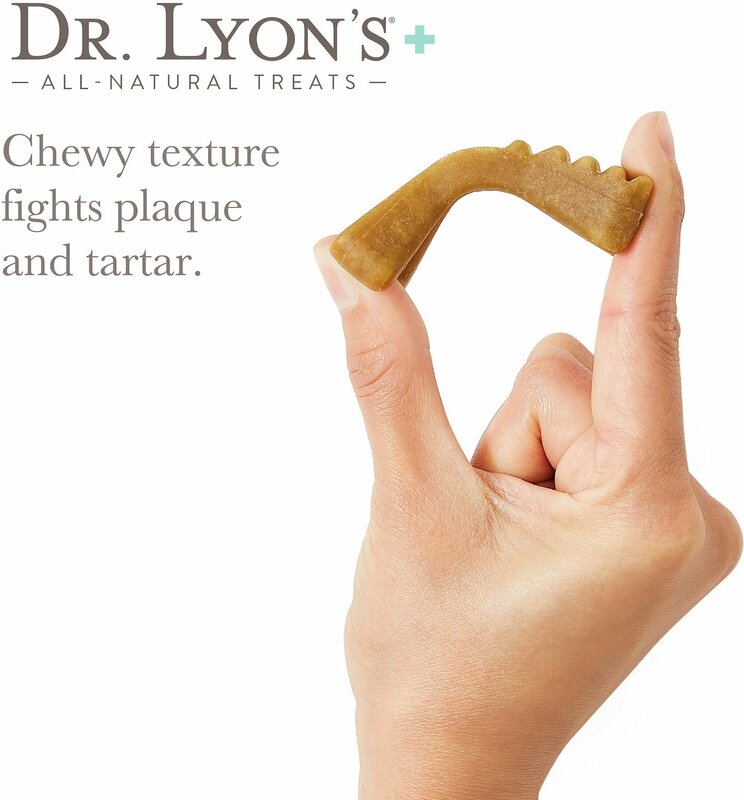 In between regular brushings, Dr. Lyon's Dental Treats for Dogs helps you keep up with your dog's dental routine with a chewy treat they're sure to love. It's specially designed to fight plaque and tartar with a shape that's half toothbrush and half bone that dogs will see as a tasty treat. The textured surface features ridges and grooves that help clean teeth as your dog chews. With Dr. Lyon's, you don't have to worry about the ingredients that are used to make these treats. Not only are they manufactured in the USA, but they're made with domestic and imported all-natural ingredients, so you can feel good about giving these flavorful dental chews to your dog. Although Dr. Lyon's Dental Treats for Dogs are tough on doggy breath, they're formulated to be gentle on your dog's stomach. They've included natural peppermint oil to refresh your pup's breath, and because they're grain-free with no corn, wheat or soy, these dental treats are also easy to digest. Inspired by the first veterinary school in Lyon, France, Dr. Lyon's combines modern science with trusted veterinary methods to create pet products for your dog's best health. They've carefully chosen safe and effective ingredients to include in each unique formulation. These ingredients are selected for specific health benefits, and are combined with the flavors dogs love that are easy to give to your pets. Dr. Lyon's always puts your pet's health first while delivering convenience and peace of mind for pet parents. Let me start by saying my pup is Greenie’s number 1 fan. I was trying to find a less expensive alternative and came across Dr Lyons. My girl has been picky about her dental treats in the past, but we’re on day 4 of Dr Lyons and she still has the same excitement every day for dental treat time! I like how straightforward the ingredients are and that they’re mint scented. Definitely try these out if you’re looking to save money on Greenies! I love these dental treats. I get one everyday when my mom leaves to go to class or the hospital. Sometimes I wait to eat it until she comes home, but usually I just can't help myself and have to eat it right away. My other dog friends tell me that their humans don't like kisses because of their stinky breath but my breath is always good and my mom loves kisses. These take me much longer to chew than greenies and are much more economical. I give it 5 paws up! Both dogs love these but I noticed that my Mini American Shepherd (small Aussie) who has some dental issues is finding it difficult to chew so I heat it in the microwave and let It cool before giving it to him. I watch him as he eats it My wheaten Terrier loves them and has no problem eating them. Debating if I should buy again because of his problems. I am very happy with these. They are big without being too big. I wasn't looking for grain free, but I will definitely buy again. The dogs love them as they are very satisfying. They aren't coming back asking for something else. Maybe there is something to be said for grain free! My pups love these! And one of my dogs is pretty picky. These are more affordable than greenies and definitely comparable. Slightly more minty smelling (which I think is a plus) and a little less brittle than greenies. Our 7-month-old mixed breed puppy seems to love these dental treats' taste and texture. We give her one every afternoon and she'll usually have the treat devoured in 1 minute or so. Teeth look great to date. My Samson man loves these! And it's the first dental chew that doesn't make his stomach upset, which is a huge plus! I make sure to always be stocked up with these bones! 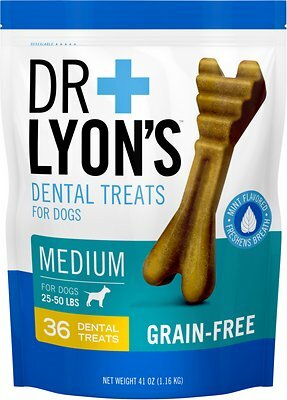 We cannot attest to how well these Dr. Lyon's Dental Treats clean their teeth, but we can tell you that the dogs love them. We give one to each of our 5 rescues after the last meal of the day. They thoroughly enjoy the chewing experience. These dental treats are great. My dogs both love them and sit by the cupboard where I store them, waiting for me to give them one. These smell minty-other dental treats I have bought have unpleasant aroma. Will buy these again.